Conan undergoes rigorous training with the IDF’s Karkl Battalion and is almost immediately deemed unfit for duty. Conan O’Brien recently took a trip to Israel to see the country, to meet the people and, of course, to make a fool of himself in the name of culture exposure. 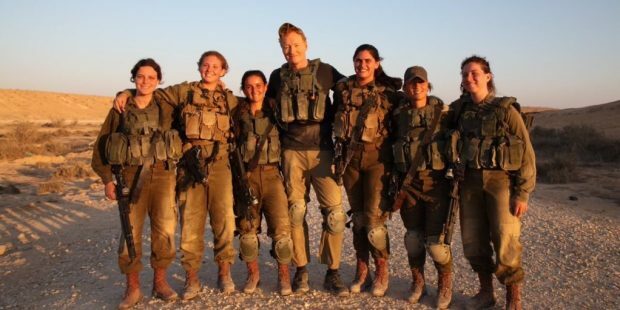 This included training with the women of the Israel Defense Forces, who tried their best to take Conan through a military obstacle course. Conan … well, he did his best. You are nothing more than European Zionist terrorists committing antisemitic atrocities against Semitic Palestinians. Your days are numbered whether you like it or not.